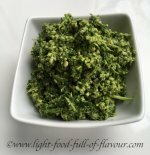 I cook a lot of Asian-style food and I find that this type of food requires a different style of salad to accompany all the fragrant, sharp and hot flavours. What you want is the combination of hot, sweet, sour and salty flavours - flavours that you typically find in Southeast Asian food. This carrot salad is such a fresh-tasting one. I admit that it it's not very spicy - you could add some chopped chillies to the salad if you wish. Personally I find that it's enough with the sharpness from the spring onions (scallions). I serve it, among other things, as a side-dish to my Asian-Style salmon Soup – a really superb combination of two incredibly tasty, light and low-calorie dishes. I found the recipe for this Asian-style carrot salad in a Swedish cook book at a friend’s house. I don’t remember the exact recipe but this is pretty similar. There’s no need to be exact with something like this anyway. 1. Lay out the Gem lettuce leaves in a salad bowl. 2. Mix together the oil, fish sauce and lime juice. 3. 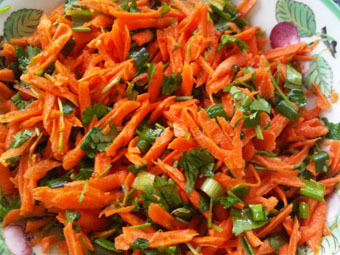 Place the grated carrots, chopped spring onions (scallions) and coriander in another bowl. Pour over the dressing and mix well. Place the mixture on top of the lettuce leaves in the salad bowl.